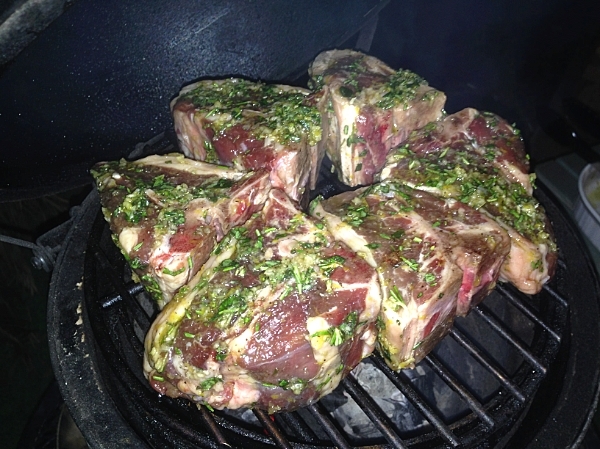 The other week a member on the Egghead Forum who goes by the handle R2Egg2Q posted up a picture of some lamb chops that he had cooked and they looked amazing. I don’t have much experience cooking lamb. I suppose it might be partly that I did not grow up eating it. And partly because of the price tag, I’ve been afraid of messing it up. R2Egg2Q’s lamb looked so good, though, and everybody said it cooks up just like a small steak, so I figured I’d give it a shot using his recipe. Don’t those look pretty? I picked them up at Central Market and they were about 2 -2.5″ thick. Not being a lamb expert, I wasn’t sure how many to get and erred on the safe side by getting six (which turns out to be way too many for 2 people BTW). Total cost came out to about $33. Gee…I hope I don’t screw this one up. 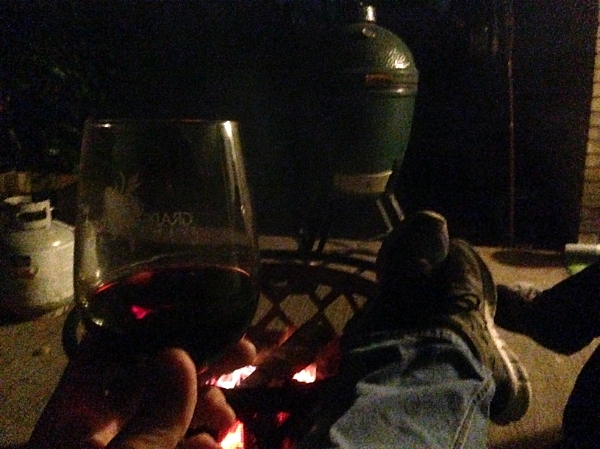 Onto the Mini Big Green Egg at 450F, just barely fit. Mix the herbs, garlic, lemon zest, salt and pepper and EVOO together in a small bowl. 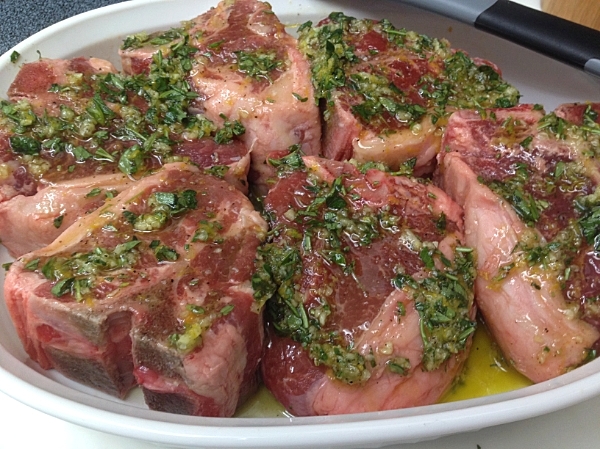 Place the lamb chops in a dish just large enough to hold them. Brush the marinade on both sides and allow to sit for at least 2 hours. Set up your grill for a direct cook and preheat to 450F. 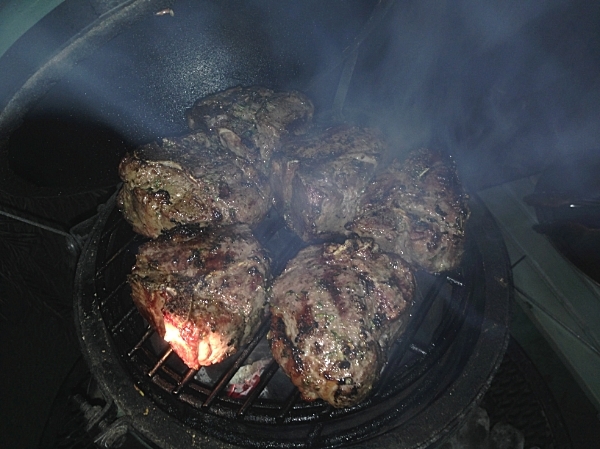 Lightly dust the lamb chops with Red Eye Express (or other coffee flavored BBQ rub) on one side. Place dusted side face down on grill and lightly dust the other side. Grill 4-5 minutes per side or until internal temp reaches 130-135. 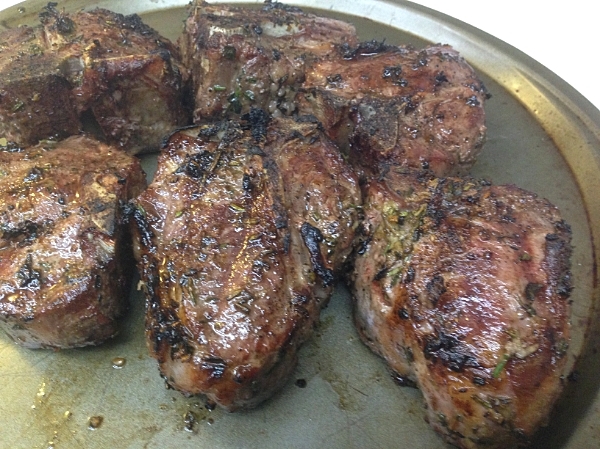 Remove from grill, loosely tent with foil and allow 10 minutes to rest before serving. I really don’t know why I was worried. If you think about it, they are just like really, really tiny t-bones or porterhouse steaks. 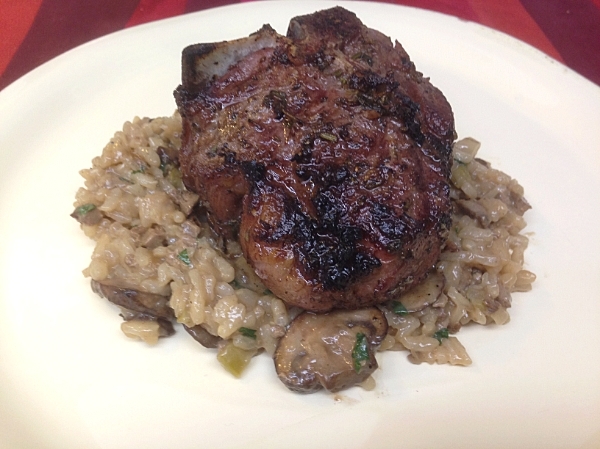 Or even pork loin chops. Same part of the animal, just smaller. 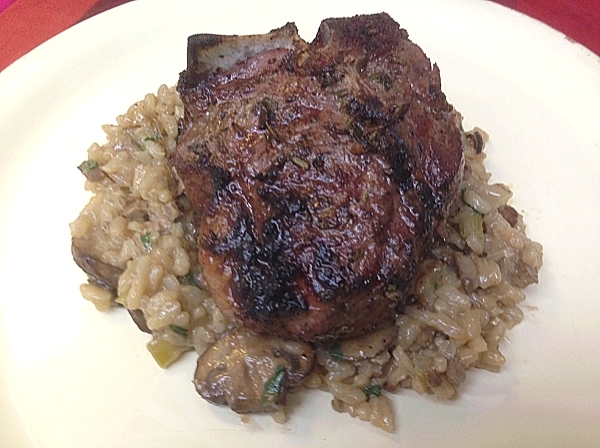 Mrs. G whipped up the Winter Mushroom Risotto that can be found in the February 20014 issue of Southern Living. Not a real hard recipe, but it is time consuming as it takes constant stirring for 30-35 minutes. Enjoyed some quality time around the fire. What I would do differently? Not much. I think the only thing I would change would be to cook them on a bigger grill. Cooking them on the Mini was just pushing it. Really crowded grate and they were hard to flip and maneuver. That much meat really drops the temp of the grill as well. Yeah, I’d definitely do them on the Large next time and that’s about the only change I would make. Previous: Previous post: WHY NOT?? I agree, these chops look incredible. I don’t have good luck with pork chops, mostly a texture issue. Thiis has inspired me to give it another try. Pinned. What kind of texture issue are you having? Maybe we can fix that. I wish lamb wasn’t so OUTRAGEOUSLY priced in these parts.